Renuka has over a decade of experience in venture philanthropy and has invested over $80 million in philanthropic capital directed toward ideas that can break the cycle of poverty. Most recently, Renuka served as an Entrepreneur-­‐in-­‐Residence at Revolution Foods. 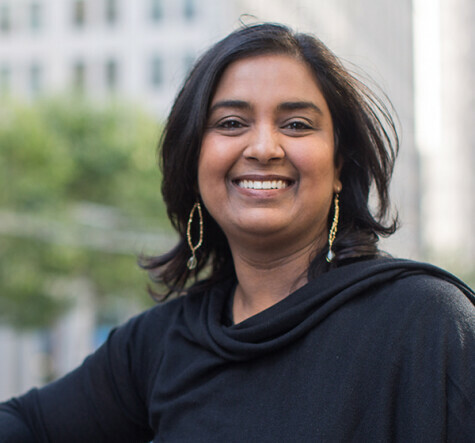 Prior to working with Revolution Foods, Renuka was a Principal at NewSchools Venture Fund, where she focused on the firm’s investment strategy, and led due diligence and management assistance for the firm’s non-­‐ profit and for-­‐profit portfolio ventures. Before NewSchools, Renuka was a Senior Program Officer at the Robin Hood Foundation. Her work at Robin Hood included developing and implementing a strategy for a $65 million relief fund, one of the nation’s largest, created to respond to the attacks of September 11th. Renuka launched her career in the public sector at the White House Office of National AIDS Policy during the Clinton Administration. She received her bachelor’s degree in biology from the University of Michigan, and completed her graduate work at Emory University, where she received a master’s in public health from the Rollins School of Public Health. Renuka holds a certificate in Innovation Leadership from California College of the Arts and is an alumnus of the Coro Leadership Program. When not thinking about ideas that can change the world, Renuka can be found daydreaming of returning to the Himalayas through Tibet.